Lady with Shield coat of arms tapestry shows a crest created for the wedding of Elizabeth Charlotte d' Orleans, niece of King Louis XIV. Based on the 17th century originals, we see here a lovely royal crest showing the French emblem of the fleur de lis on a blue background in the central shield which is tilted, with the royal crown above. A lady, cherub and angel is seen holding up these royal symbols, surrounded by architectural and floral motifs. This is a grand coat of arms full of elegance. 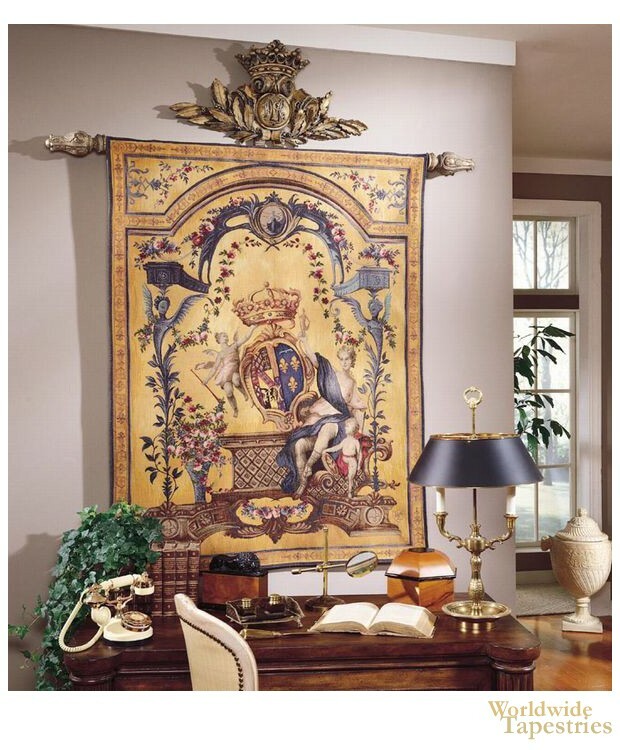 This royal crest or coat or arms tapestry "Lady with Shield" is backed with a lining and has a tunnel for easy hanging. Note: tapestry rod and accessories, where pictured, are not included in the price. Dimensions: W 45" x H 57"